Coffee With Games: New Play Control! 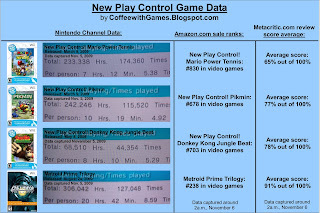 Wii Nintendo Channel Game Data Comparisons! New Play Control! 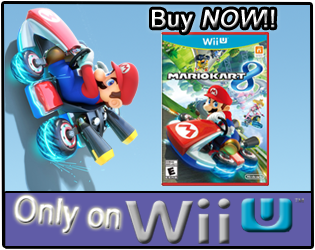 Wii Nintendo Channel Game Data Comparisons! Nintendo Channel data, now with Amazon.com sale ranks and Metacritic.com average review scores! New Play Control! Mario Power Tennis has 32,409 players reporting data on the Nintendo Channel. New Play Control! Pikmin has 23,480 players reporting data on the Nintendo Channel. New Play Control! Donkey Kong Jungle Beat has 8,384 players reporting data on the Nintendo Channel. Metroid Prime Trilogy has 14,790 players reporting data on the Nintendo Channel. I just thought about how The Legend of Zelda: Twilight Princess on the Wii, was really just a GameCube port with Wii controls added to it. Nintendo really could have labeled it, "New Play Control! The Legend of Zelda: Twilight Princess". Do you own any of these games and if so, which one have you played the most? I own both Pikmin and Metroid Prime Trilogy. I definitely like Pikmin better, mostly because I've played a whole lot more. I beat Pikmin, while with MPT, I've only played an hour or so. On a similar note I'd also like to pick up NPC! Donkey Kong Jungle Beats since I've heard it's a pretty awesome platformer. @Kyle: Do you think Nintendo of America is holding off on releasing NPC Pikmin 2, because they are going to do a "Pikmin Trilogy" type game pack like they did with the Metroid Prime games? Also, I only own NPC! DK: JB yet I have not taken the game out of the shrinkwrap. Lousy backlog. I know Pikmin 3 isn't out, and not much has even been discussed about it...I was just speculating on why NPC Pikmin 2 hasn't been released, and was looking at how Nintendo did the Metroid Prime Trilogy. I think that it would be surprising for Nintendo to include Pikmin 2 as a bonus disc with Pikmin 3 (sort of like the recent GH5/GH: Van Halen deal, or even MW2 and CoD: Classic). I say this because it costs the company so little to put out those NPC titles, and they can sit on the shelves at a profitable $30 for eternity. Furthermore, if such a combo pack did exist and it was NOT deemed a special edition then I wonder if consumers would see it as a vote of no confidence in Pikmin 3 (as in how Activision gave away GH: Van Halen). Then again, the end product would eventually speak for itself, and the addition of P2 to the pack could merely be a welcome bonus that results in better sales. It would also have the welcome side effect of dissuading Nintendo from using yet another NPC title to fill in their release schedule. @G-Man: You said, "It would also have the welcome side effect of dissuading Nintendo from using yet another NPC title to fill in their release schedule." I can only hope that would happen. The NPC titles are one thing that "irks" me with Nintendo's Wii strategy. Sure, the GameCube didn't sell 50 million units, and some games were skipped over, but I wish Nintendo would work on NEW games, instead of spending people's time having them tack on Wii motion controls to older games. I haven't purchased any of the NPC games, not even Metroid Prime Trilogy, which I consider an NPC game. Though, I did purchase LOZ:TP, and that game itself could be called, "NPC LOZ:TP" on the Wii, because it was a GameCube port. 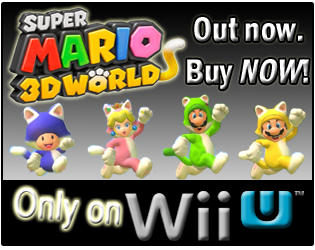 Hey I have a genious idea BUY PIKMIN 2 NPC from Australia! It's english and this way Nintendo will get so angry they will release it in the USA. It's worth a try.